Delayed-type hypersensitivity (DTH) is a useful approach for evaluating cell-mediated immune responses associated with Th1 reactivity. The DTH reaction is divided into the afferent and efferent phases. 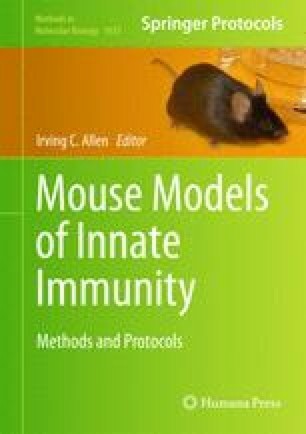 During the afferent phase of this model, mice are typically immunized by subcutaneous injection with a specific hapten or antigen in its chemically reactive state and emulsified with an adjuvant. The efferent phase is typically initiated 5–12 days after sensitization, whereby the previously sensitized mice are challenged by either subcutaneous footpad injection or intradermal ear injection. The DTH response is evaluated 24 h post challenge. Here, we describe a common protocol for the induction and assessment of the DTH reaction in mice using keyhole limpet hemocyanin.